Just-in-time management strategies continue to evolve and remain crucial for world-class business operations. 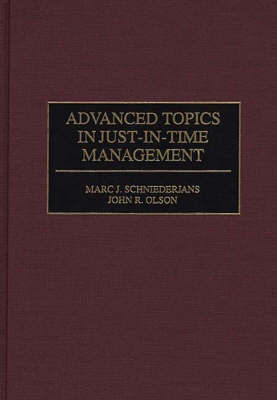 Schniederjans and Olson focus on the latest, most important advances in JIT strategies and explain how to use a broad range of information about them, pulled from the latest significant JIT literature. Covering quantitative methods and conceptual ideas often reported in obscure sources and thus frequently inaccessible even to scholars, their book makes its points with easily grasped examples to help readers put the ideas here immediately to use. An extensive, up-to-date bibliography of recent JIT books is presented in a way that will help users quickly identify titles most important for their own special needs. Production and other operations executives will find the book an essential resource in their ongoing effort to keep themselves up-to-date and stay there. Part I provides an introduction to the book's premise and basic JIT principles. Part II focuses on JIT quantitative methods, and Part III examines a series of popular JIT topics covering the most current conceptual issues. Along the way, Schniederjans and Olson explain where JIT inventory management principles can be applied, how simulation methodology can be used to improve JIT systems, and how the Kanban systems are being changed innovatively and integrated more successfully into business operations. They also show how supply chains can be improved to utilize JIT principles better, how JIT is changing production scheduling, and how managers can utilize their human resources more effectively in a JIT environment.